Dr. McElhaney research interests include compassionate and collaborative community and team-based approaches to healthy aging of older Indigenous adults in Northern Ontario. She has fostered several positive relationships with community leaders and health care leaders to help address multi-morbidity in older Indigenous adults. Her research interests with Indigenous communities intersects with other areas of interests including the impact of immunosenescence on the immune responses to vaccination, immunologic biomarkers of protection mediated by vaccination, and how vaccination plays a role in preventing disability in older adults. 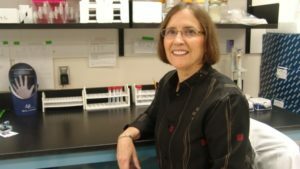 She leads the “Vaccine Initiative to Add Life to Years” (VITALiTY) Team, an interdisciplinary research team at UBC established to identify risk factors for catastrophic disability, explore the contribution of “inflammaging”, and design interventions to reduce risk of disability including vaccines. She has published “test tube” methods for predicting protection against influenza in older adults, a critical step in the development of more effective vaccines for the over 65 population. More recently her work has also included biomarker development to evaluate the effect of immune senescence on inflammation and chronic diseases, and how this might have an impact on vaccine efficacy and reduction in illness severity and risk for disability. Her research interests also include the engagement of older patients/caregivers with interprofessional teams, and research strategies to improve our understanding of how to mitigate risk and provide optimal treatment approaches to the older patient during acute health events requiring hospitalization. In the Executive Training for Research Application (EXTRA) program, she developed the “48/5” intervention to address five key areas of care needs in hospitalized seniors. The project goal is to minimize functional decline in older adults during acute hospital admission. Given that one in three older persons admitted to an acute care hospital will be discharged with a higher level of disability, the intervention is designed to minimize functional decline in older adults during acute hospitalization. Other potential benefits include improved quality-of-life indicators for patients and their families, and an improved workplace environment for health care staff.